I’ve had many many irons over the years all promising the sun, moon and earth. Well not quite, but at the very least they should be non-drip (don’t you just hate those rusty water marks) and have a smooth glide sole plate. There’s also the issue of ergonomics, aching shoulders and wrists, we want to avoid this! So, for us quilters/sewers what is a good iron for quilting? Olisomake irons specifically for quilting and today I’m taking a look at one of their models. Oliso have built their reputation by claiming to make the best steam iron for quilters. 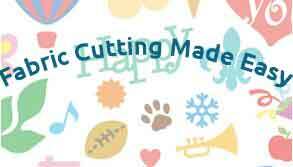 With their innovative iTouch® Technology and OnePass™ pressing Oliso have produced what sounds like a great tool for quilters! iTouch® technology –This is a Patented Scorchguards feature; as soon as you lift your hand from the handle there are feet that rise up. No more burns, tipping or scorching. The lifters stay cool, even when the soleplate is hot as they are made of heat-resistant polymers. the fabric won’t get snagged by the lifters as they recede completely into the soleplate when the iron is in use. Touch Activated Handle – This is part of the Auto-Lift System™. As soon as your hand touches the top or bottom it is “sensed” and triggers the micro motor. Ergonomic – The iron levitates (a really cool feature!) above the fabric with the touch of your hand, no more continual lifting up and down. Quad Auto Shut-Off – The Oliso has an automatic shut off if it tips over or, if you leave it turned on it shuts off after 8mns. Anti-drip system – Prevents spitting and leaking while the iron is hot, no more nasty marks on your beautiful projects. This is achieved with the auto lift system which shuts off the water flow to the system. Although the iron is in the horizontal position this happens whenever you let go of the handle. Quick Heating – Heats up very quickly with 1600 watts of power. OnePass™ Pressing – Another patented feature from Oliso gives an extra thick, mirror glide soleplate. The vertical and horizontal steam is powerful enough to remove the most stubborn wrinkles. 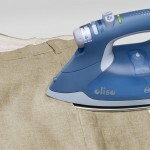 Reduce Ironing Time – The ITouch technology saves a lot of time when you don’t need to keep lifting the iron up and down. Detailer Tip – The fine tip makes it easy to get those crisp pleats, and flat seams. Extra Long Cord – It comes with an 8’8″ cord and a 360° pivot. Extra Large Water Tank – 12.7 oz for heavy steam usage. The water tank is also side loading for easy access. Large Fill Cup – Comes with large fill cup for the extra large water tank. Digital Temperature Control – This feature gives precise heating control. Weight: 3.6 lbs (when empty). 12mth standard warranty, register and you get 15mths. 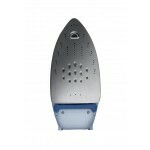 This Oliso TG1050 is heavier than a normal domestic iron though on a par with professional ones. You’ll also pay more, you’re paying for the patented technology and quality build. 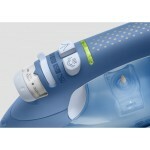 The iTouch® technology is a unique feature and in my view the best thing about this steam iron. If you’re working your way through a large ironing load or pressing seams on a large quilt you won’t get aching shoulders and wrists. I also like the detailer tip; very useful for normal ironing tasks as well as dressmaking and quilting. I can’t praise this Olisio steam iron enough! Although it’s a bit heavier than your usual domestic iron the ITouch (levitation) eliminates this issue. You can buy cheaper irons of course, but you won’t get the features or finish that this iron is capable of. It’s a good well-made iron that will last a long time so if you’ve asked “what is a good iron for quilting?” then the Olisio TG1050 is your answer! Hi Kathy. I have never even heard of Oliso irons, but the one you have reviewed is very nice. 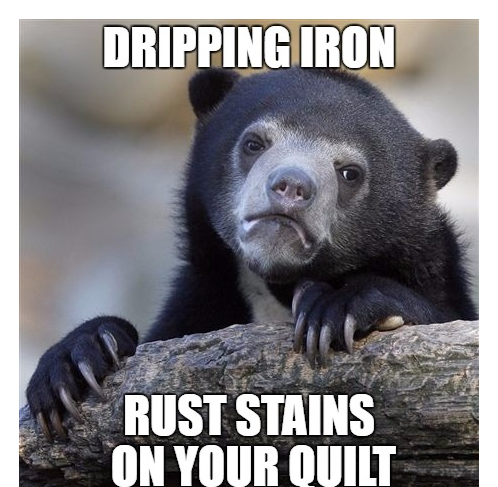 I would rather pay for a good quality quilt iron than go through numerous cheaper ones! I’m really impressed with its iTouch technology, what a great feature. Also, the OnePass Pressing sounds wonderful as quilts can be hard to iron every wrinkle out of. Thank you for sharing, this iron is one of the best I have seen! love the anti drip system. if it wasn’t to expensive for my budget I will buy it. I’ll have to show this to my partner – she’s well into the quilting experience due to her gran teachings when she was younger. This Oliso iron seems to fit the bill with quality – in my experience the ‘cheaper’ options will never provide the quality of the more ‘high end’ ones. Wow, what a fancy shmancy iron! But I love it! I love the auto shutoff and the little legs when you let go of the handle. I can’t tell you how many times I have accidentally left a burn mark on a shirt. Even if the Oliso a little bit heavier than the average iron, I think it would be worth it for the extra features. Yes, it is a very fancy iron and great for quilting! The little legs did it for me, I’ve never been fond of ironing but have these extra features makes it a pleasure! The touch feature from this iron sounds great! Never heard of the brand Oliso though . I like the features a lot and it looks like it would be a good iron for quilting and sewing. Great review; informative and to the point. Thank you Kenn. It is a good iron for quilting but also for everyday ironing too. Imagine never having a burnt shirt again, wonderful! I had an Oliso and loved it right up until it started leaking. Within a year of my starting to use it.